Today's recording and mixing software can be so complex that most of us are understandably keen to stick with what we know. But how did we get to know what we know in the first place? I suspect that many people actually become Pro Tools or Cubase or Logic users by imitation and accident. Perhaps we had friends who used the same software, or it was taught us at college, or used in the first studio we visited. It would certainly be a rare newcomer who would sit down and put all the different music software through its paces, in order to make an informed and rational choice. The result is that, in the UK at least, some very capable recording packages have remained minority options, never quite having snowballed through word of mouth. This category includes two long-established and well-featured programs: Magix's Samplitude/Sequoia and MOTU's Digital Performer. And both of these manufacturers seem determined that 2012 will be the year when this situation changes. Both Magix and MOTU have identified cross-platform support as a key element in this plan. For the last two decades, Samplitude has been tied to the Windows platform, while Performer has been Mac-only. However, a Windows version of DP is expected early this year, while Magix have confirmed that a Mac port of Samplitude is in the advanced stages of development. Magix have also reconfigured the Samplitude product range, to address a problem of perception they felt was holding back its acceptance in some markets. Last time SOS reviewed the program, in October 2010, the top-of-the-range Samplitude Pro 11 retailed for over £900: more than twice as much as most rival recording packages. The more affordable Samplitude 11 was a very capable package, but some users no doubt felt that for around the same price, they would rather have the 'full' version of Cubase or Pro Tools 9 than what seemed a cut-down version of Samplitude. As a result, there has been a wholesale change. While Magix's related Sequoia package, targeted mainly at mastering houses and broadcast applications, will move to version 12, its music production-oriented sibling has been reinvented as Samplitude Pro X. The key point in this reinvention is that Pro X, which retails for around the same price as Samplitude 11, and is thus a direct rival for the likes of Cubase or Pro Tools, is not at all a cut-down or hamstrung product. 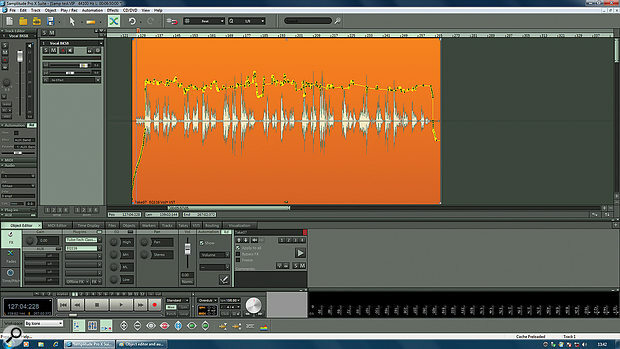 Pro X is the flagship version of Magix's DAW, and includes the full Samplitude Pro feature set; and although there is still a Samplitude product at the higher price point occupied by Pro 11, this has been renamed Samplitude Pro X Suite, to reflect the fact that the basic program is exactly the same in both cases. The 'Suite' appellation denotes the inclusion of additional bundled plug-ins and sample content, which we'll come to shortly. A related change is that Magix have abandoned the use of a hardware dongle. Existing users can still choose this method of authorisation (and it may be preferable for those who want to move between computers often), but new copies of Pro X can be activated using a simple Web-based procedure. I'm sure this will be a welcome move for many, especially as users are allowed to activate a single licensed copy of the program on up to three machines. There have, of course, been changes to the program itself, and arguably the largest of them is one that has only an indirect effect on the user: the application and its bundled plug-ins have been re-coded for full 64-bit operation. In making this move, Magix have also taken the opportunity to rethink aspects of Samplitude's user interface, partly with the aim of making it more accessible to new users. This has involved making Samplitude's numerous windows more manageable, by providing a central point in which they can be docked. Likewise, key windows within Samplitude, such as the Object Editor, have been redesigned. Last year, Magix bought out the renowned sampler and sound library developers Yellow Tools, and the first fruits of this purchase are tempting indeed: Samplitude now comes with the full version of their Independence soft sampler, complete with 12GB library, while the Suite includes an astonishing 70GB of Independence content. 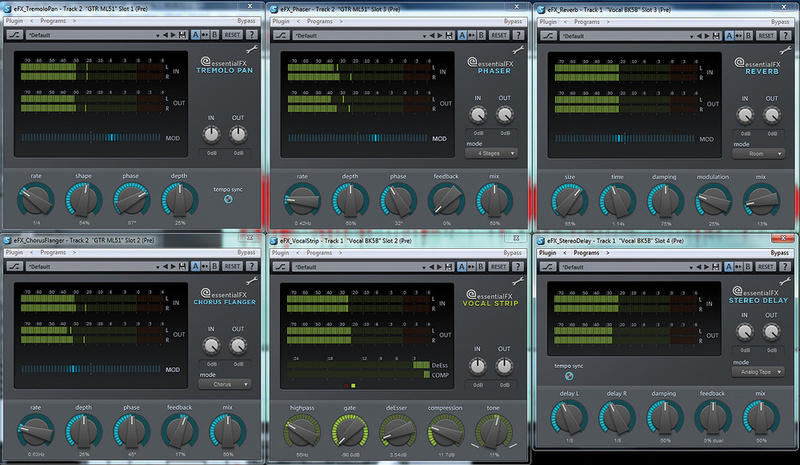 Elsewhere, the battery of simplified Essential FX basic effect plug-ins has been restyled and expanded to 10 plug-ins. Other new features include better tempo-mapping facilities, Eucon support for Avid's Artist series controllers, surround mixing and improved 'visualisations' (of which more presently). Should you wish to transfer projects from or to another program, meanwhile, Magix have made things easier by adding support for the OMF and AAF file interchange formats. And finally, in the 'surely that's still the realm of science fiction' category, Samplitude Pro X now includes spectral editing — familiar from packages such as CEDAR's ReTouch — at the track level, allowing you to invisibly remove thumps, clicks, motor horns and other sounds from individual tracks, without leaving the arrange window. An SOS review of such an established software package would usually focus almost exclusively on its new features, but since this version forms part of a concerted effort to attract new users to the Samplitude platform, and since I'm one of those new users, I thought I'd begin this one by outlining some of its most important features, and recounting the experiences that await fellow novices. A positive experience awaits on opening the box: there's a printed manual. This is accompanied by an excellent interactive HTML Help system, which doesn't look as flash as a glossy PDF manual, but is much more friendly to use, especially with the new Pro X enhancement of a search field built directly into the Samplitude menu bar. For all this, the documentation is rather terse in places, and can take a bit of getting used to, partly because it seems to have been translated from the German, and partly because it kicks off with a slightly terrifying explanation of the numerous different input monitoring options. At first glance, Samplitude's interface is functional and fairly busy, with strips of buttons running along the top and bottom. If you prefer a different look, it's all very configurable, and a number of workspaces and different graphical 'skins' are available. Magix have made a concerted effort to control the proliferation of windows in Pro X by introducing various ways in which they can be parked. The most important development here is the Docker, which in its default mode, divides the screen in two horizontally, allowing the lower half to display the Object Editor, MIDI Editor, or any of nine other windows that were floated in previous versions. They can still be detached from the Docker and made to float, if you wish, or docked in other places, such as adjacent to the transport bar at the bottom half of the screen. Not having used the previous version, I'm not sure how much of an adjustment the Docker will require for existing users, but it seems a sensible move to me. In general, though, I think it's fair to say that Samplitude is still not a product of the minimalist school of software design. The mouse, for instance, can be switched between no fewer than 15 different tools, while there must be twice as many menu and submenu items as there are in Cubase or Pro Tools. Many things that are handled using drag-and-drop interfaces in other packages are accessed through dialogues — a typical example would be re-ordering the plug-ins on a mixer channel's insert slots. If you're a fan of 'streamlined' interfaces such as are found in Presonus's Studio One or Ableton Live, this might not be to your taste, but reflects the amazing density of features that are found in Samplitude and the thoroughness with which they are implemented. Magix use the term Object to refer to what other manufacturers call 'regions', 'clips' or 'events': sections of an audio or MIDI recording positioned on a track in the arrange window. One of Samplitude's key features is the extent to which these Objects can be manipulated independently of the track to which they're assigned. Most audio packages now let you apply fades and overall gain adjustments to individual clips, along with offline (destructive) effects processing, but Samplitude's audio Objects go much, much further. They can have their own real-time insert effects and aux sends — all of which, along with the Object's output level and pan position, can be fully and graphically automated, and stored as presets. They can be pitch-shifted and time-stretched, and you can even set an existing Object to refer to a completely different source audio file, should you wish. It really is no exaggeration to say that it is perfectly possible to mix an entire multitrack recording using only Object-based processing, and many Samplitude users do just that, using the mixer only for subgrouping and bus processing. The advantages of this approach are many. If you decide to pick up an Object and move it to a different track or time position, all of its associated Object-based effects and automation simply come with it. In a post-production environment, it allows complex projects with thousands of sound effects to be handled using just a few tracks. And, of course, Object-based effects are only active when the Object is actually being played back, so it's typically a very CPU-efficient way of doing things — and if you do run out of CPU power, you can easily render them. Here's a simple real-world example where Object-based processing proved handy when I used Samplitude to mix a soundboard recording from a gig. About halfway through the show, the live sound engineer had applied a gate to the tom mics, which I was receiving post-fade from his desk. As a result, the first half of each tom track was recorded with spill, and the second half without. In Samplitude, it was trivially easy to split these Objects at the relevant point and apply my own gate as an Object effect to bring the first part into line. Object-based processing is handled using a window called the Object Editor, which is among those found lurking in the Docker, and can be resized and displayed in various formats. The Object Editor follows selections made in the main arrange window, so if you happen to click on a different Object, it will switch to showing that Object's parameters. The revamped Object Editor. The automation visible on the selected Object is controlling its output level, rather than the channel fader on the track, and will follow it when the Object is moved. The Object Editor has been significantly modified in Pro X. Previous versions used conventional Copy and Paste commands to transfer settings from one Object to another. These have been swept away, and in their place are four snapshot 'slots', each of which stores an entire configuration of effects, EQ, gain and so on (but not automation). To transfer one Object's settings to another, you simply Shift-click on one of the slots to store the settings, select the new Object in the arrange window, and click on the slot. You can also use the four slots to audition different processing chains. Or, to give a more complex example, suppose you were faced with a vocal recording that suffered both from sibilance and pops: you could set up three different snapshots, one with your usual vocal processing chain, one with a high cut to tame sibilance, and one with a low cut to tackle the pops. You could then slice up the vocal take wherever you encountered a sibilant or a pop, and apply the relevant snapshot to each of the resulting Objects. Better still, Object settings can be saved to disk and recalled for future use (though not, puzzlingly, by right-clicking on the slots), allowing you to build up a library of settings for different types of source recording, or to share them across multiple mixes from the same recording session. This is simply excellent. One of the great things about Samplitude is that it rarely attempts to force you into a particular way of working. So if you'd rather forget all about Object-specific parameters, you still have access to a very well-specified mixer, with inserts, aux sends, panners and so on, not to mention nice touches such as a Mono button in the master section and a gain pot at the top of each channel. Routing seems pretty flexible, with the usual limitation that you can't send or output a channel to itself, but there are a few quirks that you need to watch out for. One is that although automation in general is sophisticated, for some odd reason it's not possible to use automation to switch plug-ins in and out of bypass — a strange omission in a program that is otherwise so powerful. A more fundamental issue is that in both the Mixer and the Object Editor, most of Samplitude's built-in plug-ins are handled differently from third-party VST or Direct X plug-ins (yes, Direct X is still supported!). Should you wish to change the order in which they affect your signal, you'll need to open a Routing dialogue, and even then it's not possible to have, for instance, a Samplitude EQ116 sandwiched between two third-party VSTs. This being Samplitude, there are, of course, gazillions of routing options, so this doesn't seriously impair its flexibility, but it does add apparently unnecessary complexity. Magix told me that the reasons for this are historical. As well as saving Object snapshots to disk, Samplitude can also store effects chains and channel routing presets, and these can be loaded in either the Object Editor or in Mixer channels. However, unlike Object snapshots, effects chains don't include the built-in processors, and it does seem rather cumbersome to have three different sets of files, in different incompatible formats, for what are basically variations on the same thing. It would be better to have just one kind of file, and either ignore any Object-specific parameters when such a file was loaded in the Mixer, or allow the user to choose which elements get imported, as you can with Pro Tools' Import Session Data function. In previous releases, support for surround mixing was one of the features that separated Sequoia and the full-blown Samplitude Pro from the mid-priced Samplitude. The rethink of the Samplitude product range mentioned earlier means that it has now been incorporated into Pro X: so, not a new feature, but new at this price level. A variety of common output formats are catered for, and a number of core Samplitude effects processors can work across up to six channels, including the Room Simulator convolution reverb. To make use of them, there are surround buses and auxes as well as a surround master output. As yet, however, there are no surround audio tracks or Objects, so to create a surround mix, you'll need to pan mono or stereo tracks within a surround bus. This being Samplitude, surround panning can of course be done at the Object level as well as at the track level. Objects that are routed to the Surround output bus bypass the conventional mixer by default, but it is possible to have them feed both a surround bus and a stereo bus. This screen shows the neat integration of MIDI tracks and soft-synth audio outputs that's possible in Pro X. Each of the four MIDI tracks is feeding the multitimbral Independence sampler on a separate MIDI channel, and each shares a mixer channel with the stereo return carrying its own sound. Mention of the Mixer leads me to another good example of the way in which Samplitude tries to cater for every possible circumstance, this time relating to the way in which software instruments are integrated into its mixer. In other applications, there are two typical approaches. Some offer instrument tracks, which behave as MIDI tracks for the purposes of recording and as stereo audio tracks, carrying an instrument's output, for those of mixing, routing, automation and so on. These economise on screen space and locate all the information relating to that instrument in a single place, but don't tend to work well with multitimbral VST Instruments, where you typically need several MIDI tracks feeding the same instrument, which in turn outputs on multiple stereo channels. As a result, many host programs take the alternative approach of allowing instruments to be hosted in a separate virtual space, such as Cubase's VST Instrument rack, fed by MIDI tracks and outputing on some variety of audio channel into the mixer. This is a much more versatile arrangement, but can be confusing and messy, with no clear association between MIDI tracks and the audio outputs they are responsible for. Samplitude's approach arguably represents the best of both worlds. All MIDI tracks are akin to what Pro Tools or Cubase call 'instrument tracks', in that as well as allowing you to record and edit MIDI data, they have an audio path which behaves exactly like that of a conventional audio track. Right-click on an insert slot, or the MIDI output routing in the track inspector, and you can add a VST Instrument. At this point, Samplitude will ask you whether you wish to have that instrument treated as a simple stereo-out device, or whether it has multiple outputs that should be split out across several tracks. In the latter case, there are several ways in which things can be arranged. 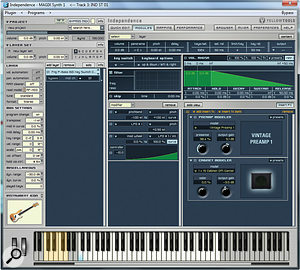 You can, for instance, choose to have separate tracks for MIDI and for an instrument's audio outputs, as in Cubase; but you can also arrange things so that each audio output from the instrument is returned to the same track that contains its corresponding MIDI data — in effect, allowing a multitimbral instrument to be treated as a series of 'instrument tracks'. You can even choose to have several audio outputs returned to a single track, or a single output duplicated across multiple tracks. (In fact, until you get used to it, it's rather easy to do this by accident!) And nearly all of this can be set up either from the mixer itself, the track inspector in the arrange view, the interface of the virtual instrument, or the dedicated VSTi page of the Docker. I know of no other implementation which can compete for flexibility, and the ability to retain the association between MIDI tracks and audio outputs even with multitimbral instruments is an invaluable aid to 'mixer hygiene'. 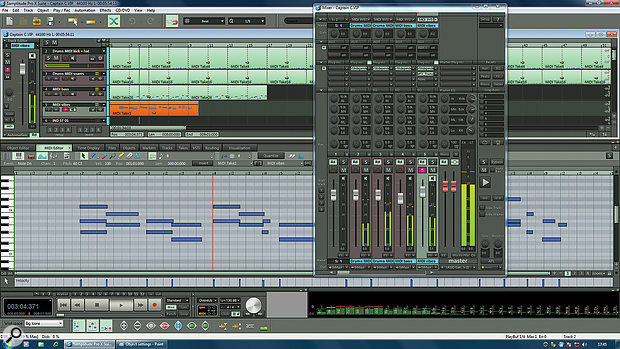 Pro X is the only Windows DAW that currently includes a fully featured software sampler at no extra cost. 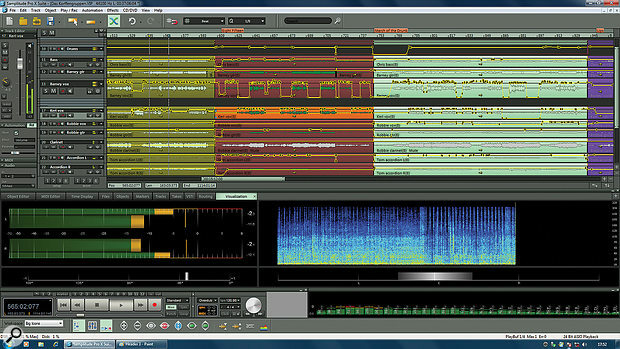 Samplitude's neat handling of multitimbral instruments comes into its own with the newly included Independence sampler. This has been reviewed a couple of times in SOS in the past: version 1 in June 2006 (/sos/jun06/articles/ytindependence.htm) and version 2 in July 2009 (/sos/jul09/articles/ytindependencepro.htm). Fundamentally, it doesn't appear to have changed a great deal since version 2, and the integration into Samplitude mainly involves mundane things like eliminating the need for additional copy protection. Rather than describe its complex workings in great detail here, I'll refer readers to those previous reviews; so far as the program itself goes, suffice to say that it's a very powerful and flexible software sampler, albeit with a few design quirks. The version of Independence that comes with Pro X is not in any way crippled or limited, and can be used to create as well as play back sampled instruments. 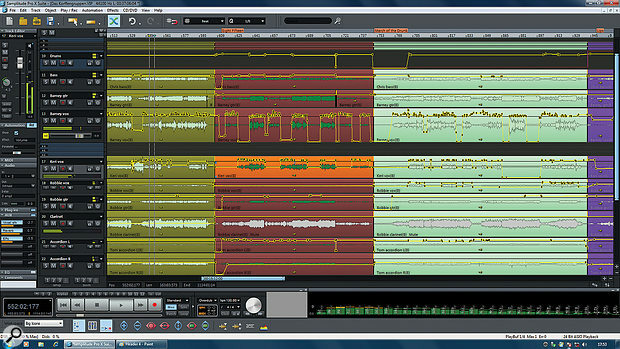 This makes Samplitude the only Windows recording package I know of that comes with a fully featured sampler at no extra cost: a pretty major bonus when you consider that buying Avid's Structure or Steinberg's Halion 4 to complement those companies' DAWs will set you back several hundred poundsdollars. In this day and age, however, not too many people seem to do their own sampling, so it's likely to be the factory library bundled with Independence that sees the most action (especially as there are few third-party libraries available in its own format). At 12GB, the library bundled with Pro X is pretty generous in size, though it actually provides fewer instruments than, say, the 6GB library you get with Steinberg's Halion Sonic. And, in general, its contents reflect what Robin Bigwood said in his review of Independence 2: what there is sounds excellent, but quite a lot falls into the category of 'what there isn't'. So, for instance, there are strong drum kits, a fairly good acoustic piano, superb electric basses, a really good solo saxophone with all sorts of keyswitched articulations, more nice pop brass, surprisingly good church organs, an interesting selection of ethnic percussion, and a lot of electric and acoustic guitars. But what you gain on the roundabouts, you lose on the swings, or, rather, the strings: there are no string or wind instruments at all, no double basses, no drawbar organs and no usable (to me) electric pianos. This seems odd, and means that most people will probably want to augment Independence with additional instruments, or upgrade to the full 70GB Premium version bundled with Samplitude Suite — although, unless this has changed since Robin's review, it won't completely fill the gaps. Incidentally, it seems that in the longer term, Magix's takeover will not mean the end of Independence as a stand-alone product, nor of further development. Although the former Yellow Tools team are mainly working on that Mac port of Samplitude now, there will be an Independence 3 in the fullness of time, and it will be available in other plug-in formats. Perhaps some of these curious holes in its sample library will be filled then. 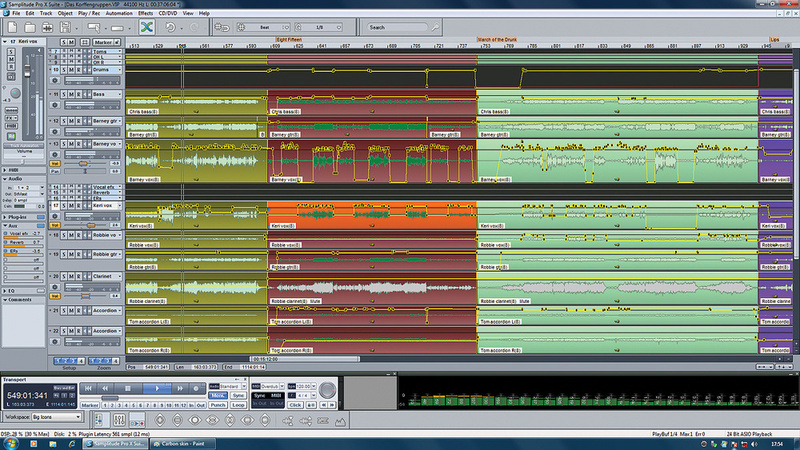 Like Pro Tools, Samplitude originated as an audio editing package, with MIDI a relatively late addition. It's perhaps not as advanced as in an application like Cubase 6, but caters for most needs, with separate drum and piano-roll editors, and reasonably flexible quantising, velocity scaling, and so on. New in Pro X are a basic MIDI Transpose function, along with functions to reverse a melody top to bottom or back to front — perfect if you are involved in a speed fugue-writing contest — and MIDI time-stretching, which allows you to quickly change the duration of a MIDI Object to fit a predetermined space. Pro X's new Tempo Track is actually an automation lane that can be displayed on another track of your choice. Tempo changes are mirrored in the timeline by Tempo Change markers (top) or Grid Position markers (below).The major new MIDI-related feature is the Tempo Track, which, confusingly, is not a track at all; tempo is actually an automation parameter which doesn't have a track of its own, but can be displayed as a lane on any MIDI or aux track. Samplitude was already capable of representing varying tempos and time signatures, but the ability to draw the former in graphically is a major improvement in usability. There are now two possible ways of creating a tempo map to fit existing material, as tempo change markers can be switched between BPM and Grid modes. The latter is new, and means that tempo markers retain their musical (bars and beats) locations as you drag them around, providing a simple way to ensure that important bar and beat locations in your tempo map line up with the relevant points in a rubato audio or MIDI recording. You can switch between the two modes at any time, and changes made in the Tempo Track are reflected in marker positions and vice versa. It's also possible to set the tempo by tapping, while the sophisticated Remix Agent introduced back in Samplitude 8 offers numerous ways to automate the process of either conforming a tempo map to a freely played drum part, or editing a rhythmic loop to fit a predefined tempo. Should you wish to quantise a multitrack drum recording to a tempo grid, in the fashion of Pro Tools' Beat Detective, meanwhile, there's a versatile Audio Quantisation Wizard. All in all, it's rather elegant, and very flexible. A feature of Pro X that is, as far as I'm aware, unique is its new implementation of 'spectral editing'. If you haven't come across this technique before, it sees the contents of an audio file represented as a spectrogram, with time along the X-axis and frequency on the Y-axis, and colour variations used to indicate how much energy the signal contains at a given frequency at any particular moment. The idea is that unwanted noises will be visible as anomalous lumps or lines of colour within the otherwise regular patterns of the musical content; these can be selected with the mouse and simply erased, in theory permitting unwanted events to be removed from a recording after the fact. A Spectral Cleaning plug-in was already available for Samplitude, but the innovation in Pro X is its integration directly into the arrange page. You can, if you wish, view all audio on all tracks in spectral mode, and edit multiple tracks at once if you choose; alternatively, you can right-click on an individual Object and have only its contents displayed that way. This is definitely the more prudent approach in any sort of large project, as the intensive calculation involved takes a while even on a fast computer. Once your audio is visible spectrally, you can zoom in to isolate any offending noises, select the Spectral mouse tool and draw a rectangle around them. A simple OK/Cancel dialogue appears: click OK and the noise will be wiped out (again, this is not instant). Spectral editing at the track level: this accordion part contains clattering noises that are even more unwanted than the accordion itself! If they can be seen, as here, they can be drawn around and removed; in the third screen they are no longer audible at all, yet the wanted audio has not suffered. I confess that when I first read about this track-level spectral editing I thought it would prove a bit of a gimmick, but in practice, I was quickly converted. It's very useful to have access to this functionality within a multitrack project, because it provides a transparent way of removing the noises that can mar individual parts: lip noises in a vocal take, accidental knocks on the body of an acoustic guitar, and so on. Tackling these with volume automation, or conventional editing, can leave an audible 'hole', whereas spectral editing often does an unparalleled job of preserving the wanted parts of the signal. That said, the only editing action that this implementation offers is to erase unwanted noises — if you want to perform more complex tasks, you'll need the plug-in. Samplitude Pro X's astonishingly comprehensive feature set is epitomised by its metering window. Titled Visualizations, it can be docked or floated, and provides no fewer than 10 different tools for representing Samplitude's audio output visually. (The Visualizations window can be set to display the signal at any output bus, but can't be pointed at individual tracks or Objects.) These range from standard displays such as a peak level display, spectroscope, vectorscope and phase correlation meter to more unusual options like a scrolling spectrogram, a virtual oscilloscope, a bit meter and even a tuner. All but the oscilloscope are highly configurable, and include many useful but not often encountered options, such as K-system metering in the peak display, and the option to show RMS and peak meters simultaneously. A highlight of Samplitude Pro X is the reworked and immensely flexible metering. The reworked Visualizations window can display up to five of these meters simultaneously, and you can click and drag the boundaries between them to resize them. They should also resize themselves intelligently to fit the window, but in practice this behaviour proved a little unpredictable when the window was floated. Samplitude is the latest of the established DAWs to make the move to 64-bit, necessitating a major internal rewrite. Like many other 64-bit programs, it features a 'bit bridging' system that allows use of 32-bit VST plug-ins. When the review copy arrived, I had just taken delivery of a new music PC from Scan Computers, running Windows 7 64-bit on a 3.4GHz quad-core Intel Core i7 CPU. And on this clean system, Pro X was very stable indeed. That said, it should be pointed out that I was concentrating mainly on testing its built-in plug-ins rather than using third-party VST plug-ins, and because this was a new computer, Samplitude didn't have any outdated plug-in versions or accumulated crud to deal with. Thanks to hyperthreading, the Core i7 presents itself to applications as eight virtual processing cores. A preferences dialogue lets you set an upper limit to the number of CPU cores Samplitude will use, and defaults to three. Having raised this to eight, I tried to stress it out by running multiple stereo instances of a demanding 64-bit plug-in, in this case, Softube's Classic Channel. The first signs of distress became apparent after the 51st instance; I tried the same test in Cakewalk's Sonar X1, and achieved marginally better results, with 55 instances. Samplitude does offer innumerable performance-related options associated with plug-in buffers and so on, so it's possible that a better result could be achieved by optimising these. Writing this review, I have been struck by the contrast between Pro X and the last DAW I looked at in these pages, Presonus's Studio One. Lean, minimalist and newly developed, Studio One embodies a lot of current ideas about user interface design, and feels very easy to get to know. It's immediate, it's slick, and nearly everything is handled using drag and drop. Yet although drag and drop is an attractive paradigm in some ways, an application like Studio One is only intuitive as long as your intuitions happen to coincide with those of its developers. When that happens, it's a joy to use; but when it doesn't, you run up against its limitations pretty hard. To take but one example, Studio One v2's take comping functionality is entirely premised on the assumption that you are recording your takes in loop mode. If you are, it works very well — but if, like me, you never use loop recording, it's pretty much unusable. Samplitude Pro X is the polar opposite. Despite the changes to the user interface that Magix have made in this version, I don't honestly think that anyone would consider it 'immediate'. The new docking features, the reworked Object Editor and so on certainly help to give it a friendlier face, but it is nevertheless easy to feel intimidated by the sheer number of buttons, windows, menu options and dialogues in evidence. A certain quirkiness also pervades the application, and takes some getting used to. Ultimately, although there are frustrations involved in working with such a complex package, they are nothing compared with the frustration of finding out that a less complex application just can't do what you want it to. Samplitude Pro X is simply the most well-specified audio recording software I know of, and although Pro X users might feel overwhelmed sometimes, they will never, ever feel outgunned. A selection of the new Essential FX plug-ins.Prior to this review, my own contact with Magix products had been limited to the various plug-in bundles that have been spun off from Samplitude and sold as independent products. 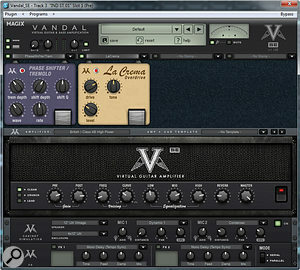 These include the very nice Vintage Effects and Analogue Modelling Suites, and the versatile Variverb Pro algorithmic reverb, all reviewed in SOS August 2007 (/sos/aug07/articles/magixplugins.htm), and the superb Vandal amp simulator, reviewed exactly three years later (/sos/aug10/articles/vandal.htm). One of the things that now separates the Samplitude Suite from the basic Pro X is that full versions of all of these plug-ins are included. 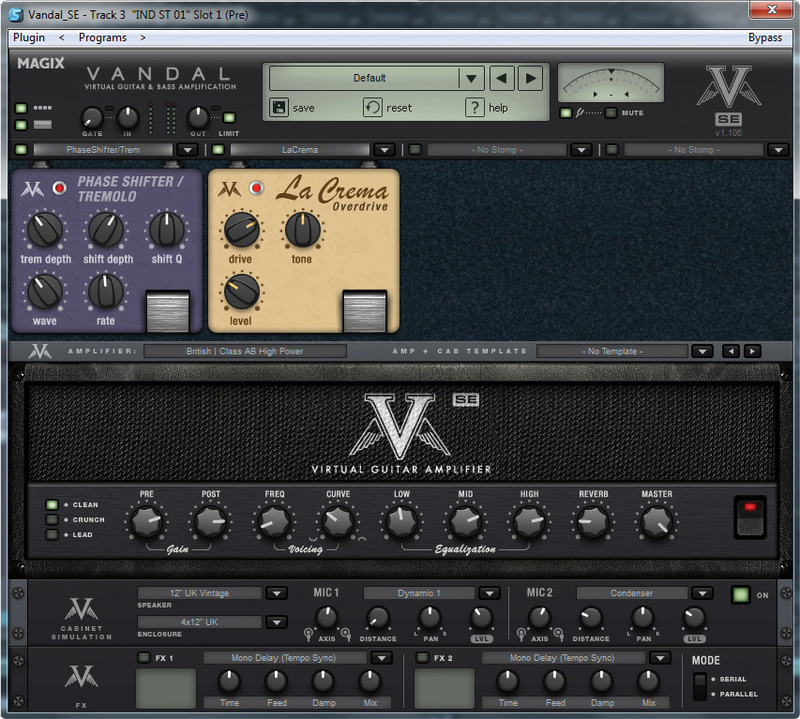 Pro X users don't do too badly, though: the Vintage Effects Suite is here in its entirety, as is Variverb Pro, while the included 'SE' versions of Vandal and the AM-Track tape emulator plug-in are still very capable. The former, for instance, loses the additional 'under the bonnet' editing parameters that are accessed by clicking on spanner icons in the full version, and has only four stomp-box emulations, but still sounds great and is easily flexible enough for everyday use — infinitely more so than, say, the cut-down version of Avid's Eleven that you get free with Pro Tools. Though slightly cut-down compared with the full version, Vandal SE is nevertheless very capable and sounds great.Other bundled plug-ins seem to fall into several different groups, each with its own look and feel, so the collection as a whole has a rather heterogeneous appearance. The plainest interfaces are reserved for utilitarian processors such as EQ116, Dynamics, Advanced Dynamics, Multiband Dynamics, Multiband Stereo Enhancer, sMAX 11 limiter and Room Simulator, but in many cases conceal very powerful internals. EQ116, for example, can operate in oversampling or linear-phase modes, and features real-time FFT displays of input and output signals, and even a display of the Group Delay (phase shift) your settings are introducing — something I've not seen before in any EQ plug-in. The others, despite their plain exteriors, are equally well specified, and I rarely felt the need to augment them with third-party alternatives. New and improved in Pro X is the Essential FX suite, which provides 10 simple-to-use plug-ins for everyday tasks. 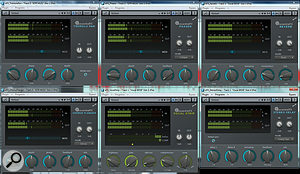 These are a reverb and delay, a de-esser, a gate, a phaser, chorus/flanger and tremolo/autopanner, a compressor with built-in soft clipping and external side-chaining, a tube saturation emulator, and a vocal-oriented channel strip. Again, these share a common look and feel, albeit a very different one from EQ116 and its siblings! In general, these seem to me a very welcome addition. They are simple enough that you can grasp how to use them immediately, yet versatile enough to perform nearly all of the functions you'd want of them. The gate, for instance, can take its side-chain signal from elsewhere in the Mixer and filter it if necessary, and adds switchable soft knee and hold functions to the basic threshold, range and time constants. Finally, I should also mention the restoration tools that come bundled with Pro X. There are five of these, all derived from Magix's Cleaning and Restoration Suite, and comprising a de-hisser, de-crackler, de-clicker, de-noiser and de-clipper. Despite the very basic controls these are effective and useful, and more than adequate for many everyday jobs, especially in conjunction with the new spectral editing functions. I had always suspected that the arsenal of bundled plug-ins was one of Samplitude's strengths, and having used them, I'm convinced. Despite the sometimes plain interface design and the routing issues alluded to earlier, it's the sound that matters, and here the quality is almost uniformly excellent. Few of these plug-ins are seriously restricted in terms of functionality, either, and I never found myself wishing for controls that were absent. 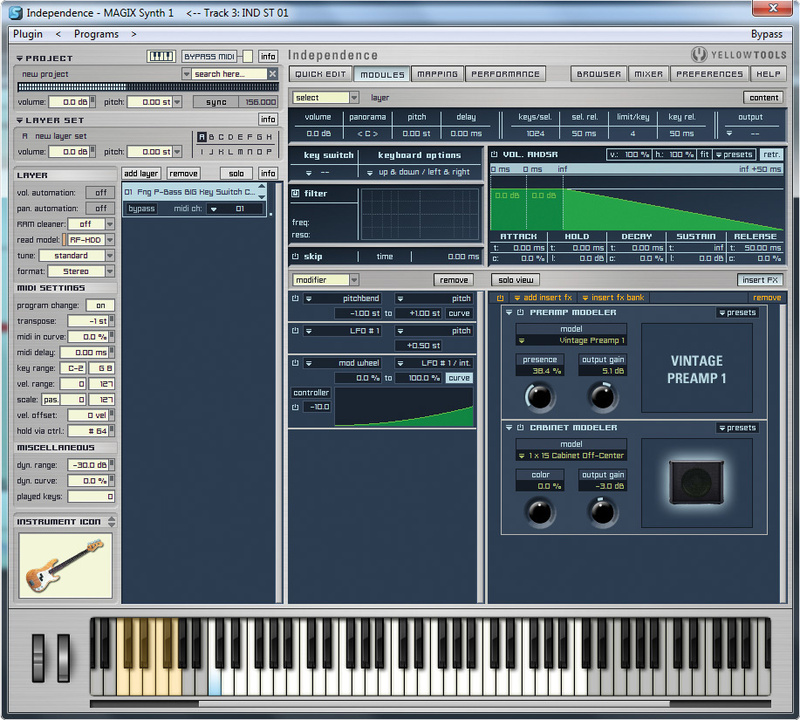 As mentioned in the main text, the only difference between Pro X and the more expensive Samplitude Suite is that the latter includes additional plug-ins and sample content. These are the full version of Vandal, the Analogue Modelling Suite Plus (which adds the powerful Am-munition mastering processor to the three original plug-ins as reviewed above), and an extra 58GB(!) of instruments for the Independence sampler. None of these I would consider essential, and in fact, the Pro X plug-in armoury is still very generous by comparison with other applications — it's much more comprehensive than that, for instance, which is bundled with current versions of Pro Tools. There's no Auto-Tune-style real-time pitch corrector, but the Elastic Audio pane of the Object Editor provides sophisticated graphical pitch correction. One of the down sides of choosing an application that isn't the industry standard is that if you need to transfer multitracks to and from other systems, you can't always expect to send and receive them in your own system's native project format. In recognition of this, Magix have added support for Open Media Framework (OMF) and Advanced Authoring Format (AAF) files, which Samplitude Pro X can both export and import. When exporting, you have the option to embed audio files, copy them, or refer to the originals, and you can choose to exclude automation and have stereo files exported as dual mono (allegedly for Pro Tools compatibility). In practice, I found it absolutely necessary to experiment with these options, as not all settings produced sessions that would open both in Cakewalk's Sonar X1 and Avid's Pro Tools 10. Eventually, however, I did manage to transfer my test projects, and all of their edits appeared to be in the correct places, though none of my automation made it across (the same projects reopened perfectly within Pro X). It wasn't clear to me whether the faults lay in Samplitude's export or in the import functions of those other applications, but it's probably fair to say that if you have regular clients who work in a different system, you'll need to put quite a bit of thought into the best way of transferring projects, and that it may well prove a bit of a headache. 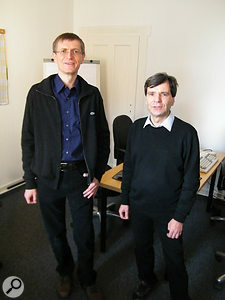 Tilman Herberger (left) and Titus Tost of Magix.Like many other audio applications, including Steinberg's Cubase, Emagic's Logic, Ableton's Live and Presonus' Studio One, Samplitude began life in Germany — but unlike them, it has its roots in the former Communist bloc. 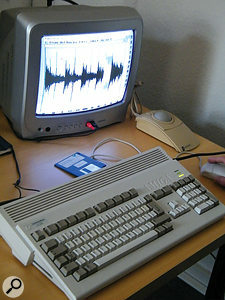 Tilman Herberger and Titus Tost met at university in the former German Democratic Republic, where they managed to get their hands on the first Commodore Amiga microcomputer to make it through the Iron Curtain. It was for this platform that early versions of Samplitude were developed and, following the reunification of the country, released commercially. From the beginning, it was a fully native application, and in 1994, Herberger and Tost ported Samplitude to the Windows platform. They remain very much in charge of its development. The Magix company was founded in 1993, and alongside professional tools such as Samplitude, developed a formidable range of multimedia products in the music, video and photo markets, currently employing around 330 people. The main company headquarters is in Berlin, but Herberger and Tost still head up a large software development team in Dresden, where I met them in January this year. Titus Tost maintains a small Samplitude 'museum' at their Dresden development HQ. One of the highlights is an original Amiga running the very first release version of the program.From the very beginning, two hallmarks have defined the philosophy behind Samplitude: the 'object oriented' approach to editing and processing, and an obsessive commitment to purity of sound quality. With respect to the former, Tilman Herberger explains: "We were always convinced that it makes sense to have real-time effects on the smallest possible level. We did not like the idea of having to use a whole track simply to apply an EQ, so the idea was to have it for each clip independently of the next clip. All our other software tools share the same concept of non-destructive object-based editing. It is very common in the video area today, but not so common in the audio area — and we have it for both. It makes the project very clear, because you need only one track, but you can use 20 effects one after another. It is also very CPU-economic, because only the actual audible effects [at any one moment] have to be calculated, no matter what comes in five minutes or what was three minutes ago. It is very useful for guys who have to deal with hundreds or thousands of cuts, and this is the case, for example, in the classical music area. Herberger is sceptical about the notion that there are no sonic differences between audio programs. "There was a test that was done a few years ago by a music conservatory, where they compared digital audio workstations — only the mixing [ie. summing] of the tracks — and then they made a really good blind listening test. In this category was also mixing via simply passive resistors, because everybody says 'This is the best way you can mix audio signals on an analogue level.' In this contest we won, together with one or two other digital audio workstations, on the same level with the analogue resistors, because this was the group where the listeners could not discern differences. "And we have also the Intel processors in the Mac!” adds Tost. The most heavily featured Windows DAW there is. All Samplitude Pro features are now included in the much cheaper Pro X. The unique approach to working with Objects sets Samplitude apart from other programs. Neat options for handling multitimbral instruments in the Mixer. Now comes with a fully fledged software sampler and 12GB of very good-sounding content. Spectral editing at the track level is surprisingly useful, and unique to Samplitude. OMF and AAF compatibility might help if you need to transfer projects to and from other software. The sheer number of features, combined with an interface that's heavy on windows, menus and dialogues, make getting to grips with Samplitude a challenge for new users. 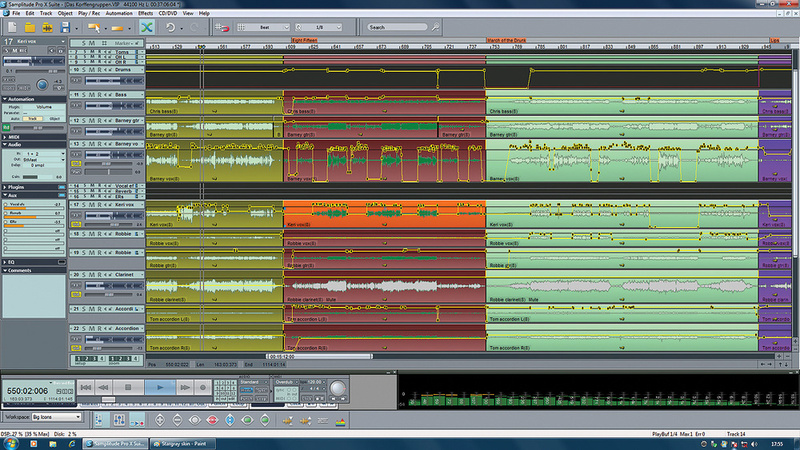 The factory library for the Independence sampler completely omits a lot of oft-used instruments. Different handling of built-in and third-party plug-ins can be confusing, as are inconsistencies within the bundled plug-in library. Successful project transfer by OMF and AAF is, at present, a bit of a lottery. With Pro X, Magix are seeking to attract new users to a long-established program. Some user interface changes and new features will help in this respect, but ultimately, it's the immense power of Samplitude that remains its most attractive quality. £449.36; Pro X Suite £898.73; upgrades from v11, £189.26 and £316.14 respectively. Prices include VAT. DACS Audio +44 (0)191 438 2500. $499; Pro X Suite $999; upgrades from v11 $199 and $359 respectively. Magix USA +1 512 914 9191. Magix Samplitude Pro X v12.0.1. Scan PC with 3.4GHz quad-core Intel Core i7 CPU and 8GB RAM, running Windows Home Premium 64-bit SP1, with Focusrite Saffire Pro 40 interface.